iPhone SLR Mount Brings Out the Best in Your iPhone’s Camera | Technology News – TechNewscast. 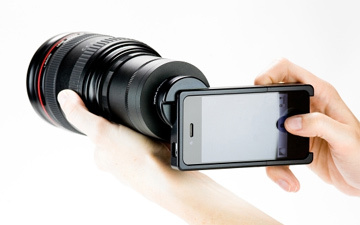 Do you have a bunch of SLR-compatible lenses lying around, with no way to attach them to your iPhone? Grieve no more: Photojojo’s iPhone SLR Mount lets you (almost) turn your iPhone into a full-fledged DSLR. The device’s function is simple: it’s a special iPhone case (together with an UV filter and SLR adapter) to which you can attach a variety of photo lenses – telephoto, wide angle, macro or fixed-fifty – which should greatly increase the quality of photos taken with your phone. It comes with certain caveats: for example, your images will be upside down, due to the fact that SLR cameras have a mirror inside them which flips the image right-side up – something that iPhone obviously doesn’t have. We’re also sure that the entire thing will look like a gross overkill to many, but we can imagine a couple of uses for it: if nothing else, it’ll surely make you a star at the next photo convention. The iPhone 4 version of the mount costs $249, while the iPhone 3 variant will set you back $190. For more iPhone photography-related accessories, check out this list. This entry was posted in Ramblings and tagged Digital single-lens reflex camera, DSLR, Engadget, iPhone, iPhone 4, Nikon, Photojojo, Single-lens reflex camera, TechNewsCast, UV filter, Wide-angle lens by pybe. Bookmark the permalink.